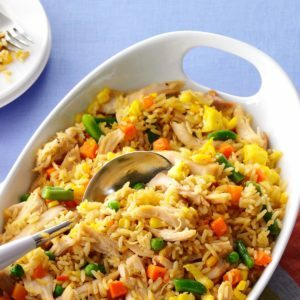 Avoid unhealthy take-out and try this homemade fried rice recipe. It’s also a great way to use up leftover protein, vegetables, and cooked rice. Making homemade fried rice is so much easier than you think and a fabulous way to use up leftover protein, vegetables, and cooked rice. Using just a few common pantry staples, you can prepare a nutritious and satisfying meal in less than 20 minutes. Preparing take-out dishes at home also helps you avoid any potential gluten in the meal. When you cook at home, you control everything that’s going into your recipe, so not only can you omit ingredients that don’t bode well with your system, but you can also add ingredients that provide nutrients like fiber, which may be lacking from take-out meals. This recipe, for example, is packed with veggies and swaps out out soy sauce for gluten-free tamari to make the dish celiac-friendly. In a small bowl whisk sesame oil, tamari, rice vinegar, sugar, and cornstarch; set aside. Heat one tablespoon of oil in a large skillet or wok over high heat. Add egg and gently scramble; remove from pan and set aside. Heat remaining oil in skillet; add chicken and vegetables and cook for 2 to 3 minutes. Add rice and cooked egg. Continue to cook, stirring frequently until all ingredients are heated through, about 5 minutes. Unlike soy sauce, tamari is not brewed with wheat. Look for it at your local grocery store or Asian market. It’s also readily available in low-sodium varieties. If you do use soy sauce and have celiac disease or gluten intolerances, make sure to use a gluten-free brand. Instead of chicken, use leftover pork, steak, shrimp or leave the meat out for a vegetarian version. Use any type of quick cooking fresh or frozen vegetables in this recipe. Alternatives include sliced bell pepper, frozen cut green beans, chopped broccoli, or baby spinach. Look for pre-packaged coleslaw mix with shredded cabbage and carrots that are cleaned and ready to cook. Cook a large batch of rice in the beginning of the week for burritos and rice bowls. A few days later use what’s leftover to make this quick and healthy recipe. This entry was posted in Comfort Food Diary, Cooking, Recipes. Bookmark the permalink.